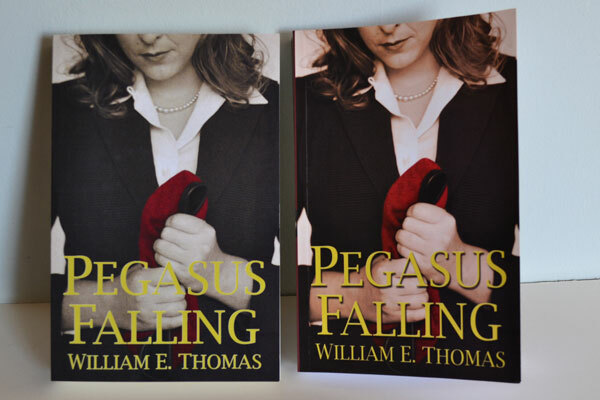 I finally received the proof copy of Pegasus Falling from CreateSpace yesterday which seemed to take its time crossing the pond. 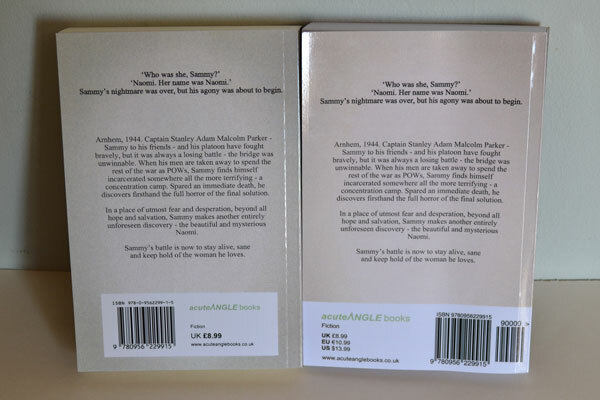 I had a good look over it and thought this would be a good opportunity to showcase the differences in build quality between the original Short Print Run (SPR) copies we had made by Biddles for the UK market and the Print On Demand (POD) copies made by CreateSpace which will be sold through Amazon in the UK and US. 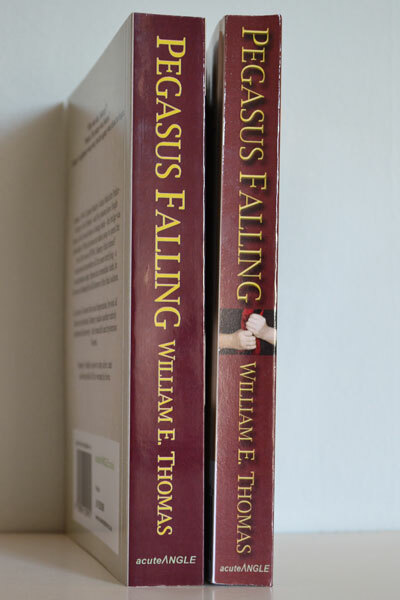 As you can see from the photo below, the front covers belay quite a few differences, despite the fact that both books have been built using almost identical files. In all photos, the short print run copy is on the left and the Print on Demand copy on the right. There are both positives and negatives to be had from both manufacturing techniques, some of which I touched on in an earlier post. Here, I’m looking at the build quality in particular. Now, bearing in mind that I have tweaked the artwork slightly from the original print run (in order to highlight the text on the cover) so ignoring those traits, it immediately struck me that the colours on the POD copy were vastly different to those on the SPR. The colours are much warmer, with a slightly reddish tinge to the whole cover. I’m putting this down to the CreateSpace printers being calibrated differently, as both cover files were built using a CMYK colour space. I think I prefer the toned down hues of the SPR book, but others may “warm” to the other cover (see what I did there?). The board used on the POD cover is of a lower grade – it feels flimsier, and you can see how much it wants to curl in the picture. This isn’t necessarily a problem, as some readers have commented that they prefer their paperbacks to be flexible and the SPR copies have too stiff a cover. Personally, I prefer the feel of the SPR copy, but that’s personal taste! You can see the red tinge in the POD cover on the supposedly monochrome back cover here. Thankfully, the quality of the image rendering on both covers is acceptable, and the text is legible. The biggest difference on the back cover is the barcode area. CreateSpace insert the barcode automatically, meaning you have no control over where it goes on the design. This is all to do with making the process as easy as possible for authors who might not be technically minded. For me, though, it caused a headache. As I had designed my back cover before CreateSpace was available, and therefore had to add the barcode myself, this meant a redesign. I’d have preferred it if CreateSpace gave you the option. It’s a shame, because I prefer the white box design on the SPR cover over the white bar on the POD. Still, both are fine, and contain identical info (bar the pricing which reflects US and EU prices now we’re international and all!). Since the proof was completed, we’ve had a couple of fairly high-profile reviews. I’ve added some excepts to the back cover, so it will look slightly different on the finished books. Now, this is the biggest difference between the two. 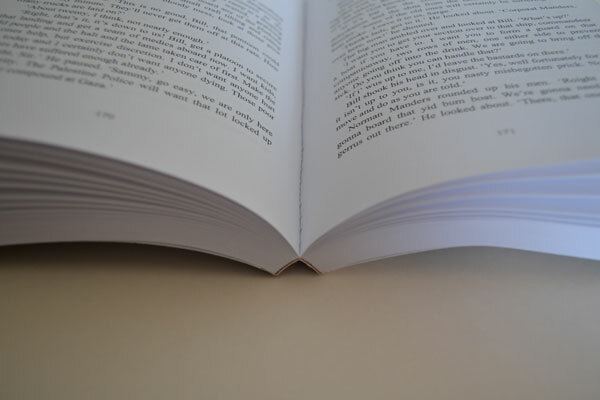 The CreateSpace book is a full 5mm thinner than the short print run copy. This is because I decided to opt for a heavier grade of paper stock for the original print run. Believe it or not, both books contain an identical number of pages. Biddles offer different paper stocks (and will even send samples to help you make your choice, which was very helpful) and I have to admit I was tempted by the thicker stock. This added to the cost of the run, but I felt it was worth it, as it made for a more impressive spine width. 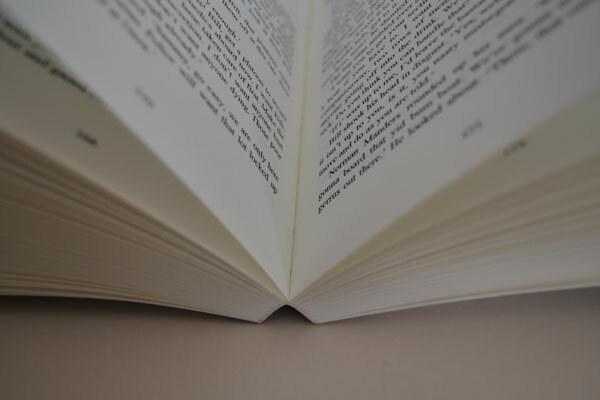 CreateSpace, however, only give you a choice of white or cream – there is no choice of paper weight. And I wasn’t even given that choice, as cream paper stock is only available with a limited choice of paper sizes, and I wanted to match the paper size of the UK books, which happens to be one of the sizes cream paper isn’t available for. As an aside, I’m really happy with the changes that have been made to the spine artwork. It’s amazing the difference that some shadowing makes to the text. I’m particularly pleased with how the cropped cover image has come out. This was included because I figured that most books on bookshop shelves will not be front-facing, so it needs something to entice the wannabee reader. I love the cover image for Pegasus Falling (courtesy of the very talented Dewi Clough) and it looks great on the spine too! Finally, a look at the interior…the meaty bit…let’s face it, the bit that matters the most (to the reader, at least). Like the cover, the interior was built using almost identical files. The CreateSpace system, however, insisted on minor changes being made, which caused some head scratching and late night cursing a couple of weeks ago. The eagle-eyed among you will spot that the gutter (the area where the pages disappear into the spine) is wider on the POD copy. 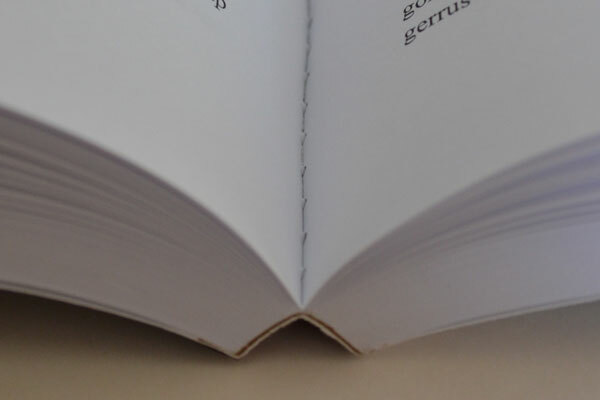 A wider shot of the pages would show that the outside borders are narrower than the SPR book too. The difference is only a few millimetres. This is an improvement in a way because the writing doesn’t slip into the gutter quite as much as on the SPR book. The difference is negated, though, because as you can see, the CreateSpace book folds back much more than the Biddles book does. I’ll almost certainly make this change on future short print runs. Now, I know that the act of breaking the spine can be a controversial one. Personally, I hate doing it (so this test broke my heart a little bit), but another member of my household loves doing it, and complained to me that Pegasus Falling‘s spine didn’t break easily enough. I cracked both books roughly in the middle. I wanted to see firstly, how easy they were to bend and secondly, how flat they’d lay. The POD copy was a lot easier to bend back, so spine-breakers will love it. It also lies very flat compared to the SPR copy, so it’s a good one to lay down on the table. Readers who like to keep their spines in tact, on the other hand, will prefer the SPR copy! As you can see from the close ups below, the spine on the SPR copy looked to be in much better shape after the crack, with the binding starting to show through on the POD copy. Now, I did give both books a good old bending back, which was probably a bit rougher treatment than they would get in every day use, but it does point to better build quality on the SPR copy. Another difference is that the text is heavier on the SPR copy. The paper stock seems to be more porous, and the ink has been soaked in a bit more. It’s not a big difference, though, and I’d rate the print quality highly on both copies. So, both copies have their positive and negative traits. I would say that the build quality on the UK-made short print run copy is slightly better than the US-made print on demand one. However, the choices made (and available to me at the time) have had a bearing on this outcome. The thicker paper stock makes for a more substantial SPR copy, and the spine is certainly a lot more sturdy. 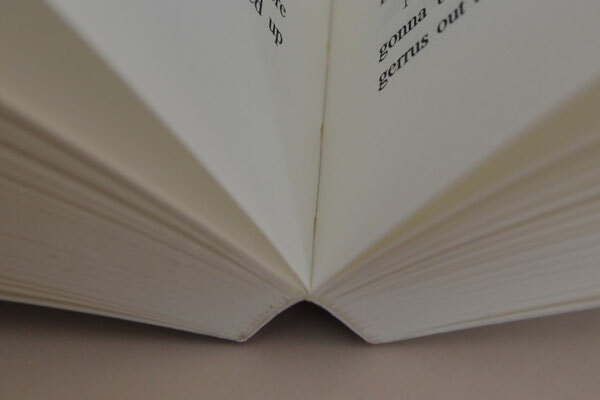 However, the POD copy is probably a bit more “reader friendly” thanks to its more pliable spine. From a publishing point of view, I’m very happy with both copies, and I’ll continue to use both manufacturing techniques in the future. The choice is there to just use CreateSpace. Copies can be ordered in bulk at a discount for the author to distribute themselves and the prices per copy are comparable when ordered in batches of 100. However, all CreateSpace bulk orders are manufactured in the US and shipped over and I’m keen to support British manufacturing wherever possible. So, Short print runs will continue to be made for distribution to UK bookshops and CreateSpace will be used for all Amazon sales channels. It’s fantastic that the choice is there. If you’re a spine breaker, head to amazon. If you’re a spine preserver, order it from your local bookshop or head to acuteanglebooks.co.uk. If none of this is of concern to you because the spine on your Kindle will never break, try here.